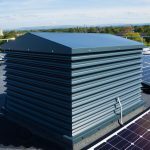 The Maximair ‘A’ Series weather Louvre has been specifically designed to provide exceptional performance characteristics in both minimum water ingress and resistance to airflow. At the same time the unique blade design offers a sharp and aesthetically pleasing line. Tested at BSRIA the A series achieved a Class A weather protection rating and up to Class 2 aerodynamic performance with an average 50% free area. The system is designed as an integrated series of components which provide enhanced water rejection. Each louvre blade incorporates a front channel and rear trap to transport excess water to the edge of the blade. In a box frame application the surplus water is shed via drainage channels within the frame sides. Various options are available to provide an effective system for every situation. 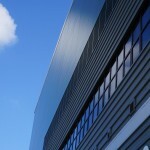 Can be used to provide weather proof ventilation or to act as an architectural facade, or a combination of both. The Maximair A series louvre has been subjected to rigorous aerodynamic testing. 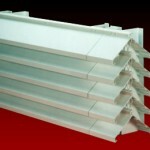 The extruded louvre blades are available in 75mm pitch. Louvre blades are installed with concealed blade support brackets onto hidden support carrier mullions, and are supplied in a series of fully assembled modules to form continuous applications. Alternatively smaller individual units can be supplied in box louvre format, fully assembled with integral top, side and cill flashings. Louvre blades are manufactured in 1.6-2mm thick extruded aluminium alloy to 6063 T6(HE9 TF). The mullions and support brackets are manufactured in 3mm thick extruded aluminium to 6063 T6(HE9 TF). Different shapes including circular, triangular, etc. 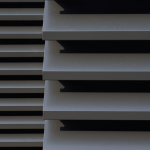 Louvres can be supplied in natural mill finish or alternatively in a range of polyester powder paint finishes (including Syntha Pulvin) with a wide choice of colours and gloss levels. Other standard finishes include anodising in Natural Silver or coloured Anolok II. Aluminium or insulated blanking plates can be mounted to the rear. In addition expanded aluminium mesh birdguards or perforated fly screens are available. Each of these can be fitted internally during, manufacture. Head, cill and jamb flashings in aluminium alloy to BS EN 485 can be produced to suit opening requirements. 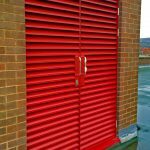 Internal and external mitred corner units are available to enable a continuous appearance of the louvres to be maintained around changes of direction. Louvre modules are supplied completely assembled either with integral box frames or concealed mullion supports, depending upon application. For applications requiring large areas of continuous unbroken appearance, installation time is minimised as all louvre blades are precisely factory pre-assembled onto supporting pre-punched mullions for ease of on site fitting by the fixing contractor. Maintenance should be carried out in accordance with McKenzie-Martin’s recommendations. Assistance with scheme design and product selection is offered by our experienced technical team.